A name or title,applied to Jesus of Nazareth matt:16:16, acts17:3). Jehovah of the Old Testament, is the I am, or the Christ of God invisible. the messiah is the promise of the visible manifestation of that "I am", or Christ, and Jesus Christ is the fulfilment in man of that original Spiritual "I am", or Jehovah. Christ is the Divine-Idea being. Jesus is the name that represents an individual expression of the Christ idea. Jesus Christ is the form of the name, that is commonly applied to the man of Galilee, who demonstrated perfection. Christ Jesus, is the idea that is being expressed by humans, as the result of their faith in, and understanding of truth. Christ is the only begotten son/daughter of God, or the one complete idea of a perfect person , in Divine Mind. We are the embodiment of all Divine ideas, such as intelligence, life, love, substance and strength.. In the Great Architect's mind, there may be one masterpiece, but that masterpiece is the sum of all the beautiful ideas, that has come to His mind. This Christ, or perfect person idea , existing eternally in Divine Mind, is the true Spiritual Higher Self, of every individual. Each of us has within themselves, the Christ, just as Jesus had, and we must look within, to recognize and realize our "sonship", our Divine origin and birth, even as Jesus did. By continually unifying ourselves with the Highest, by our thoughts and words, we too shall, become "Sons/daughters of God", manifest. 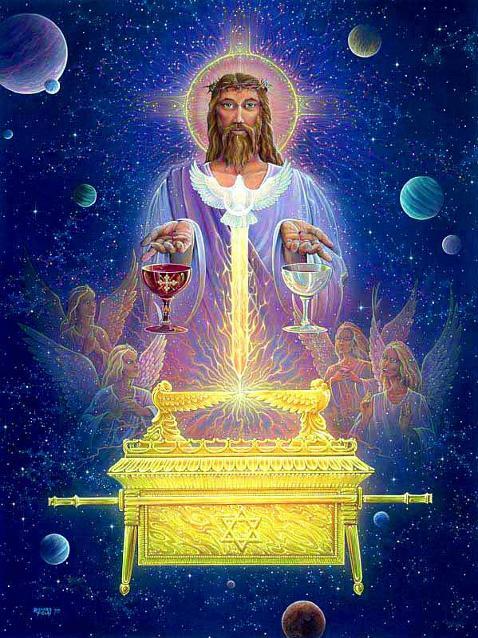 The cosmic person or grand person of the universe, often referred to by religious mystics is, the Christ, and the Christ is the higher self of us all. Thus a seemingly great mystery is reduced to simple numbers. We do not realize the nearness of this cosmic person, because we have not found our real selves. Jesus Christ educated His followers, to discern the real person. He taught that there is a power in each of us that gives us our authority, over the things of the world. This principle is the higher self, the Spiritual person, the Christ. If we would succeed, we must bring forth the principle, it gives dominion and mastery. Spiritual perception reveals to us that we are not persons, but factors in the cosmic mind. Reveal yourself to yourself by affirming , "I am the Christ, child of the living Creator". Look at yourself, not as flesh and blood, but as Spirit. Jesus Christ affirmed His true self, and the Father acknowledged Him. The reason for the limited comprehension and power, of the ordinary person is found in the fact that ,we see the world about us ,as under material law, and agreeing with it makes, ourself part of it. Christ is the cosmic being, the grand being of the universe, demonstrated, developed, and brought out, in every being. The birth of Christ in mankind, is the bringing to consciousness of the Spiritual idea of mankind-the Christ of God-through the quickening power of the word of truth. It is the beginning in the inner realms of consciousness ,of a higher set of faculties that, when grown to full stature, save the whole person from ignorance, and mistakes. It is a growth in mankind, as tangible to those who reach certain stages, as is that of a child ,to the mother. In its beginnings, it is a mere quickening flutter, under the stomach, accompanied often by unusual sensitiveness in the emotional nature. Here, we are transforming from the "Old Person" vibration, and being birthed into the "New Person" vibration, or The Ascending Christed Being. We are becoming that universal being, filled with the Christ Light. Illuminating our path and the path of many others. We are birthing ourselves in our new perfection, as the new Christ . Author unknown?